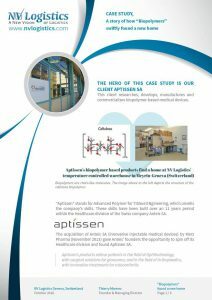 NV Logistics provides a complete solution to ensure the integrity of the cold chain through advanced technologies developed by our partners. Data collected during the transport are immediately accessible upon unpacking of the goods. Simply download the free “Log-Ic©“, install it and connect our USB sensor to your computer. In two clicks, you will get a complete PDF report showing all recorded data. 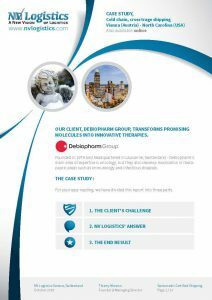 This case study presents how we worked with Debiopharm to guarantee the cold chain on a cross-trade shipments. 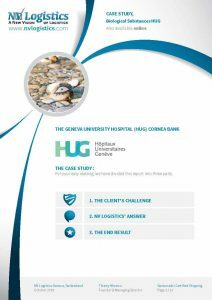 This case study presents how we helped the cornea bank of the Geneva Hospital by setting up the procedures to guarantee a safe transport of human tissues.